PT Energy Management Indonesia (Persero) - EMI or latter known as PT EMI (Persero) is a long standing Indonesian state-owned company with principal business in conservation and energy management services. Originally registered as PT Konservasi Energi Abadi (KONEBA) in 1987. KONEBA is a joint venture between five state-owned fertilizer companies; PT Pupuk Sriwijaya (PUSRI), PT. Pupuk Iskandar Muda, PT Pupuk Kujang, PT Pupuk Kalimantan Timur (PKT) and PT Petrokimia Gresik. In 1993, KONEBA has officially operated as a state-owned company under the Government Regulation No 2 of 1993. 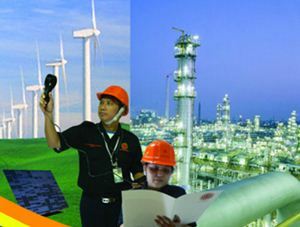 The name of PT Energy Management Indonesia (Persero) officially established in 2006. The Company is based in Jakarta and its principal office is registered at Jl Wolter Monginsidi No 4 / 6 Kebayoran Baru, South Jakarta 12160. In terms of financial performance, PT Energy Management Indonesia (Persero) improved its performance in 2014, which was from a loss of Rp5.3 billion in 2013 to a loss of Rp4.5 billion in 2014. PT EMI (Persero) effectively recorded an increase in total income in 2014 by 33.7%, which is Rp11.9 billion, compared to Rp 8.9 billion in 2013. This figures was stated by JobsCDC.com from the Indonesian State-Owned Companies (SOEs) profile 2015 issued by the Ministry of State-Owned Companies. JobsCDC.com now available on android device. Download now on Google Play here. Please be aware of recruitment fraud. The entire stage of this selection process is free of charge. PT Energy Management Indonesia (Persero) - Fresh Graduate Engineer EMI March 2017 will never ask for fees or upfront payments for any purposes during the recruitment process such as transportation and accommodation.